﻿ How do your Executive Team and Senior Management Team Dance? Does this dance resemble the Paso Doble, the Scottish Reel, Tango, Viennese Waltz, Contemporary Dance, or is it more like a Military Tattoo? The difference matters to whether your cultural aspirations can be delivered. 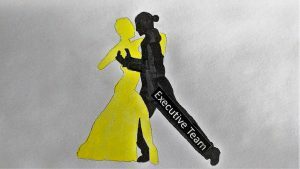 “It’s a dance, isn’t it?” was how a client recently described the relationship between the Executive Team (ET) of the organisation and the Senior Management Team (SMT). This description seemed to strike a chord with others in the meeting with a number of knowing smiles in the room, including from us as facilitators. I experience this dance in many organisations. Executive Teams organise and have gatherings together with the next level of the hierarchy, sometimes jointly referred to as the “Senior Management Team”. While these gatherings are a common occurrence in organisations we work in, the style of “the dance” between the two groups varies tremendously. They sometimes dance together confidently, but often they are hesitant and uncertain. Becoming explicit about the nature of this dance seems important as these gatherings are important rituals in the cultural tableau members of the organisation create to make sense of what is important. Sometimes how these interactions happen is highly aligned with the explicit culture of the organisation. In other organisations it may be in direct conflict with the culture organisation leaders have espoused. Generally an invitation to the meeting (an invitation to “the dance”) is crafted. Sometimes this is done with a lot of thought and crafted together between ET and SMT representatives. In other organisations we experience that the only thing SMT members know about the event is that someone has sent them a meeting invitation with an explict demand that they attend (which isn’t really an invitation at all). We also experience a real range of meeting formats when these meetings take place. We thought it would be helpful (and fun) to use a number of dance styles to describe the variety of style of interactions that can take place in organisations when the executive team meets their senior management team to “dance”. These are offered to help you make sense of your experience of such gatherings in your organisation. Hopefully they might help you to be a little more conscious of whether the nature of the dance supports of undermines the culture you are looking to support. This describes a formal and formulaic process with background music known to all. “The Viennese waltz is a rotary dance where the dancers are constantly turning either toward the leader’s right (natural) or toward the leader’s left (reverse), interspersed with non-rotating change steps to switch between the direction of rotation.” (2). – the sessions often involve a series of increasingly attractive but complicated power-point slides presented with key points preceded with drum-rolls and successes with trumpets. We at Metalogue love dance – we help executive teams improve their technique or change their dance style. So…which dance do you recognise in your own organisation?